Non-enveloped, head-tail structure. The icosahedral head is about 40 nm in diameter. The non-contractile tail is about 190 nm in length. Linear dsDNA genome of about 37 kb, containing about 55 genes. 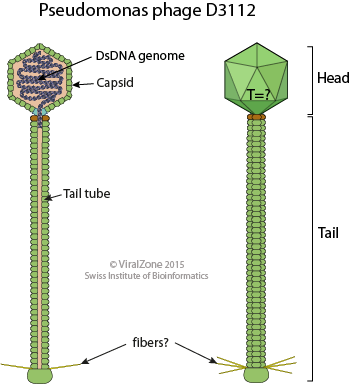 Bacterial DNA is covalently linked at the left and the right end of the viral genome. The presence of these pieces of bacterial DNA is due to the headful packaging mechanism. Replicative transposition gives rise to new copies of the viral genome in the host chromosome. Assembly of an empty procapsid and headful packaging of the genome.